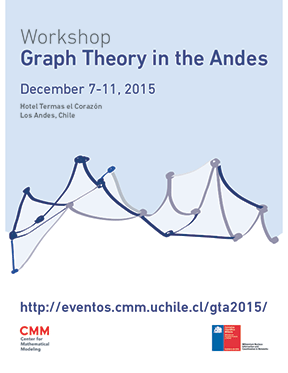 The workshop ‘Graph Theory in the Andes’ will be held at the hotel Termas El Corazón in the Aconcagua Valley, Chile. The dates are 7-11 December, 2015. The focus of the workshop is on extremal, structural and algorithmic graph theory. There will be a mixture of talks and problem discussions. The workshop is sponsored by the Center for Mathematical Modeling, and by the Millennium Nucleus ‘Information and Coordination in Networks’.